Hi and Happy Monday All! It's Cody, and I am hoping you are all recovered from the Christmas festivities this past weekend, if you don't celebrate Christmas, well, it's "festivus for the rest of us!!" 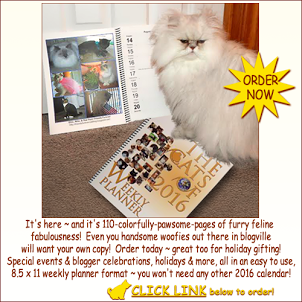 Have you ordered your Cats of the CB 2016 Calendar? I sure hope so, we would be lost without our daily calendar/planner, and we thank Mom Paula for all of her hard work putting these calendars together. Order your calendar now if you haven't already! I know Miss Paula does an awesome job. Cody, you'd brighten up the darkest week! It's been a hell of a week and you get thanks at our post holiday Mancat Monday and Secret Santa. Looking really handsome as always, Cody! Hope 2016 is the BEST YEAR yet for all of us!!!! That is great you made the calendar again Cody. I really need a weekly calendar because I am so unorganized but I also know I wouldn't use it or I would forget to look at it. You look great in the calendar, Cody! Such cute photos of you Cody. Have a great week. Cody, your page looks just terrific. That does look like a great calendar. Have a purrfect day. You look really handsome in the calendar, Cody! The best part of the Cats of the CB calendar is knowing there's a friend on every page. 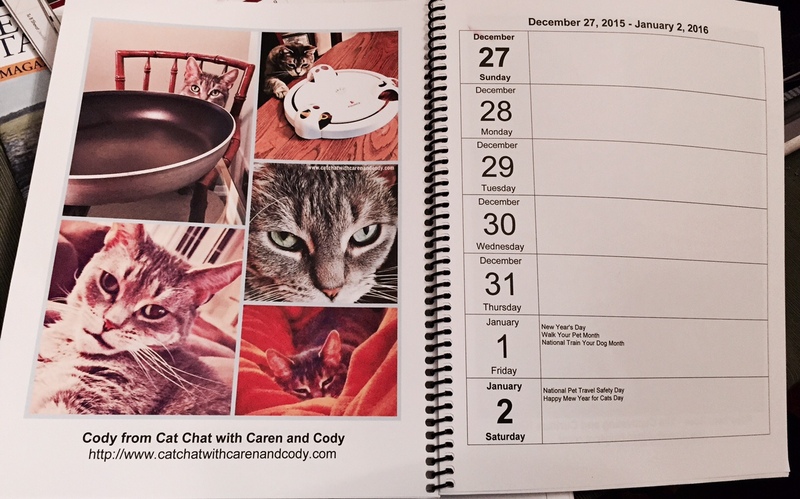 You are always the purrfect calendar dude Cody! That's a lovely calendar. I should get one as I am always hopelessly disorganized. LOL! P.S. : We have a very special story on our blog today about a truly amazing kitty. Hope you will stop by. Awww, I linked this post to Awww Mondays. So cute. I'm looking forward to a fabulous 2016 too. Lovely photo int he calendar. We didn't get one this year - maybe next. Concats on being the first to start the new calendar Cody! We would have missed you because mum is still using the 2015 calendar. She is going to use both now and duplicate everything so we don't miss seeing any of our friends. I didn't even know about these pawesome calendars, and now I'm really excited! Concatulations on being featured, Cody! The calendar sure wouldn't be the same without your handsome face in it. Purrs! That's a nice calendar. Even better because you are part of it Cody. You look great in the calendar, Cody. We have ours and cant' wait to start using it. What a great way to start the new year with a new calendar and with you on it! Wowee! You are so furmouse! Imagine being the furst kitty in the year! Now that is memorable indeed! MIAOW!! Happy New Year/Mew Year to you and your furmily, Cody! Looking good Cody! What a way to start out the New Year! We didn't know you were in the 2016 one! We just moved our week to that week but in the 2015 one so we'll have to use the new one to see you too! Pawsome pictures on you in the CB Calender ! We bought our very first calendar! We're very excited. Happy New Year to you and your mom! Hi Cody! Your card arrived today, thank you. Thanks to your mum and Dakota too. Sweet pics of you in the new calendar, Cody!